No more searches and No more fake and malicious Windows software. Just download and install ‘DDownloads’, which is a small windows Program that will get all your Windows software directly to your system. Now You don’t need to search for any Windows Applications in any software portals or any developer sites by wasting your time and resources. 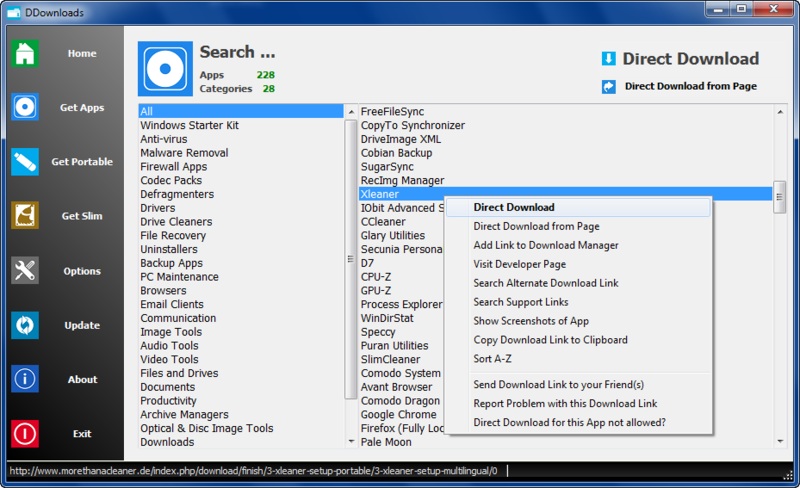 ‘DDownloads’ provides you only “Safe” and Direct Download links to your favourite Software. If a Direct Download link is not available DDownloads directs you to the Developer Page or other “Safe” Download Portal where you can get it. So you need not fear to go to a “Malicious” and “fake” page. The DDownloads Program is currently in beta stage and already has been released to public for testing purposes. This program has clean and simple user interface where you can find all kind of software. In a home screen there is many sections like must have apps, Get portable apps and windows starter kit. Just click any of the sections you want to go and you will find much more categories of softwares in a list. Choose the category you wanted to go and software lists for that category will be displayed in main window. Select the software you want to download and right-click the selection then click the Direct Download.Your software will be downloaded directly to your PC. By using this DDownloads application one can download portable applications also. To Download Portable apps, just click the’ get portable apps’ in the home screen and Download the portable apps you want to download directly. Now this program is in beta stage only. So that you could expect more changes and updates in future. If you want to add any of the features in this utility or if you have any thoughts about this app, share with us in comment section.